Royal Holloway, University of London, was one of the earliest partners to join the EQUALS global partnership in 2016, and has largely been represented in the partnership by members of the UNESCO Chair in ICT4D. EQUALS is “a ground-breaking global network delivered by a committed partnership of corporate leaders, governments, non-profit organizations, communities and individuals around the world working together to bridge the digital gender divide – by bringing women to tech, and tech to women – and in so doing, bettering the lives of millions worldwide”. Its activities are grouped into three coalitions (Skills, Leadership and Access) and a Research Group, with Royal Holloway being most active in the Skills Coalition and the Research Group. EQUALS holds its annual Principals’ Meetings in the margins of the UN General Assembly (UNGA), and this year Royal Holloway was represented by the Chairholder of the UNESCO Chair in ICT4D. The Principals’ Meeting on 22nd September discussed the progress made by all of the coalitions, and particularly the publication of the Research Group’s report entitled Taking stock: data and evidence on gender equality in digital access, skills and leadership. 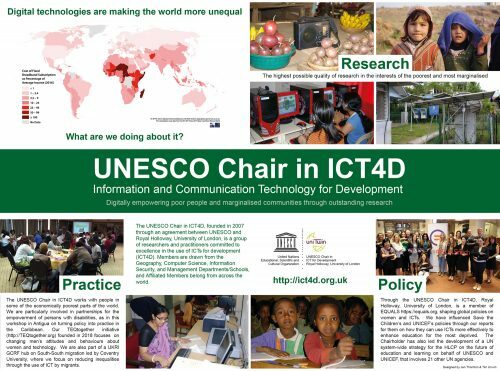 Members of the UNESCO Chair in ICT4D have been active in the preparation of this report, and the section written by Liz Quaglia and Ashley Fraser on A gender perspective of security and privacy in the digital age was particularly noted by the Rector of the United Nations University (UNU) in his speech launching the report. EQUALS now has more than 70 partners, and before the Principals’ Meeting, there was a welcome event for new members. In the evening many of us also gathered for the EQUALS in Tech awards ceremony, which celebrated the activities of global initiatives in skills, access, leadership and research that have helped deliver the overall objectives of EQUALS. With so many EQUALS partners present in New York this was also an opportunity for members of the Skills Coalition and the Research Group to meet to review progress and plan for the future. We were all very grateful to UN Women for hosting these meetings, and much progress was made in moving the initiative forward. In particular, there was widespread support at the Skills Coalition meeting for the need to change men’s attitudes and behaviours, and the UNESCO Chair in ICT4D’s new TEQtogether initiative, soft-launched at this event, was strongly supported. Indeed, the Skills Coalition has subsequently agreed that a group of its partners would have this theme as one of its deliverables for the next couple of years. Research Group: membership of, and active contribution to, Research Group – e.g. one chapter in 2018 report, as well as two people undertaking editorial work. Skills Coalition: support UNESCO in the development of the outputs through active participation in meetings, including continued participation in Mobile Learning Week. Other Coalitions: support Access and Leadership Coalitions and their deliverables by sharing knowledge and resources. We are all delighted to be able to contribute to this important initiative on behalf of Royal Holloway, University of London. Posted on October 4, 2018 October 4, 2018 by Tim UnwinPosted in EQUALS, Royal Holloway, University of London, UncategorizedTagged EQUALS, Gender, ICTs, Royal Holloway, Technology.